There are a lot of low-cost hardware options available to Internet of Things (IoT) developers, but if you’re serious about going from prototype to product, there may be more considerations than meet the eye. The availability of ultra-low-cost hardware boards and open-source software today provides easy, educational access to computer programming for those who may not have otherwise had the opportunity. For that, the likes of Arduino, BeagleBoard, and Raspberry Pi should be commended. However, these boards often carry hidden hurdles and expenses when moving beyond Maker and into the market, ones that can derail product development in the face of hard deadlines. These include component sourcing, software support, portability, and commercial-grade hardware specs, to name just a few. So, what is a Maker Pro to do? Besides options well known to the maker community, commercial-grade development kits are available that, while slightly more expensive, can eliminate time and development costs that come at a premium during later stages of a product lifecycle. But rather than explaining on end, tradeoffs between of the two types of platforms can best be examined through a side-by-side comparison. Let’s take a look at the newest addition to the most popular family of maker boards, the Raspberry Pi 3 Model B, alongside Technologic Systems’ TS-4900 (pictured on right above), and how they stack up in terms of hardware resources, software support, deployment readiness, and price. Being targeted at education and low cost, the Raspberry Pi family has traditionally been limited in terms of processing power and onboard resources. Recently though, the Raspberry Pi 3 Model B equips a 1.2 GHz quad-core ARM Cortex-A53 BCM2837 system on chip (SoC) from Broadcom. The upgrade makes for a better comparison than its predecessors with commercial-grade kits like the TS-4900 running on the 1 GHz quad-core ARM Cortex-A9-based i.MX6 processor from NXP. Below you can see how the two stack up in terms of hardware resources. 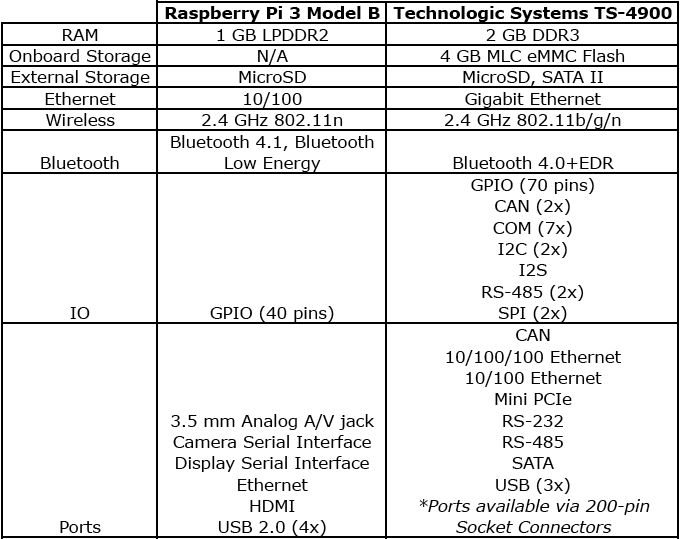 Not mentioned in the table is that the Raspberry Pi 3 Model B’s Broadcom BCM2837 is a 64-bit SoC that integrates a dual-core VideoCore IV GPU. While this amount of horsepower is well suited for compute-intensive applications such as gaming, virtual reality, or in the data center, for industrial applications it can be demanding in terms of resource utilization. For example, the Raspberry Pi’s 1 GB of memory can quickly become a limitation when running intensive analytics, whereas ample memory on the TS-4900 supporting a 32-bit processor architecture can provide headroom for full-fledged applications and flexibility for remote firmware updates in the future. But more importantly, Broadcom silicon on Raspberry Pi platforms has become somewhat proprietary in that it isn’t offered commercially to the general public. While exceptions are probably made for high-volume products, this represents serious lifecycle challenges in terms of component sourcing and availability. One casualty of this dates back to 2014, when Hardkernel was forced to “pull the plug” on its O-DROID-W platform after Broadcom stopped accepting orders for its BCM2835 SoC used on the original Raspberry Pi. By contrast, the i.MX6 on the TS-4900 is widely deployed in a number of markets and applications, and supported by NXP’s scalable, long-term roadmap. Beyond just the processor, partnering with a commercial vendor that can guarantee part availability over the lifetime of a product is a key foundation for success. Because of its open-source nature, Linux is the operating system of choice in the maker community and has even become successful in the commercial sector. Both the Raspberry Pi 3 Model B and TS-4900 support Linux variants, among other OSs listed below. The most popular OS distributions in the Raspberry Pi ecosystem are Raspbian and NOOBS, both of which the Raspberry Pi Foundation recommends. Raspbian, for instance, is continuously being optimized to run on Pi hardware platforms to improve user’s out of the box experience. But although these distros serve their purpose, they aren’t designed for commercial deployment and can become particularly cumbersome in embedded development where a compact footprint and agility are essential. The platform-specific OS engineering also makes applications less portable when trying to support a range of embedded and IoT devices, another important consideration for serious developers. For example, the Debian wiki overviews some common portability issues associated with previous generations of the Raspberry Pi. An alternative for developers looking to transition from strictly open-source software to a production-ready OS is Yocto Project Linux, a maker-friendly software framework that can be used to create customized distributions or migrated to commercial-grade Linux platforms. Beyond being pre-qualified, the added benefit of using commercial-grade Linux, Windows, or RTOS is support, which may come too little, too late when sourced from the maker community. This phenomenon is evident on many forums where discussion topics that are either uninteresting or beyond the scope of the community give inadequate or incomplete responses, or simply go unanswered (check out this StackExchange page). On the other hand, the accountability factor is evident with commercial-grade development kits like the TS-4900, with consistent engineering support available from the platform’s original designers. Another element that can be easily overlooked in early stages of the development lifecycle is component operating temperatures and overall system performance under harsh operating conditions. While this may be of less consequence for devices intended for indoor residential use, it’s highly important if you’re developing a system that could be deployed in a factory setting with high levels of shock and vibration, or in outdoor environments subject to temperature extremes. The Raspberry Pi 3 Model B sources components from multiple manufacturers, each specified to different levels and that perform differently in certain (perhaps similar) operating environments. When deploying systems in either commercial or industrial environments, delivering a product with all of its components specified to various operating conditions can mean the difference between years worth of reliable performance and failure in a matter of weeks, days, or hours. Here, starting with a production-ready development kit tested to industrial (-40 ºC to +85 ºC) temperatures from a vendor with experience designing reliable hardware can save time, money, and headaches down the line. A $35 price tag is hard to beat as PCs go, but if you’re looking to take your design to market there are hidden costs to consider. Here we covered a few of those – specifically component sourcing, software support, and hardware reliability – that can end up halting production altogether or costing thousands of dollars later in development. These costs only increase as a product matures in its lifecycle, and, at that point, an initial investment of a couple hundred bucks won’t look so bad. Alan Brown is Marketing Communications Manager at Technologic Systems.